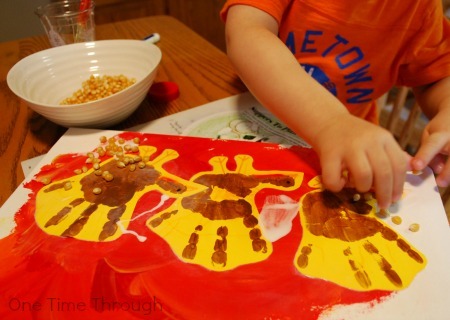 This week I’m sharing a really fun turkey handprint art project that is perfect for Thanksgiving or Fall. 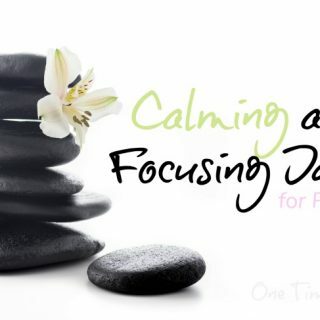 It’s open-ended with lots of room for creativity, and guaranteed to produce adorable results! It can be proudly displayed on the mantel, or used as a backdrop for a seasonal meal. 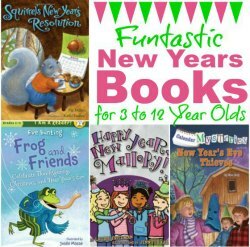 You’ll also find my favourite recommendations for reading with kids around the Thanksgiving holidays. Amazon Affiliate links are included in this post. Please see my disclosure for more details. 3D decorative items like corn kernels, plastic decorative leaves, dried leaves from outside, acorns etc. 1. 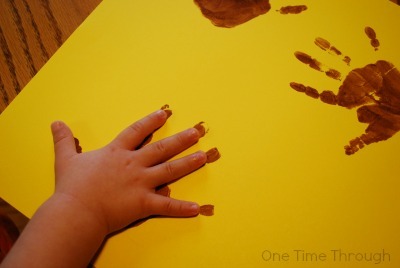 On the yellow paper, have your child make a number of handprints using the brown paint. I only got Onetime to use his right hand, but we should have done both hands so we could have had turkeys facing both directions! I guess I have a lower tolerance for messy painting than I thought…lol! 2. On the canvas, have your child paint a background scene in reds, oranges and yellows. 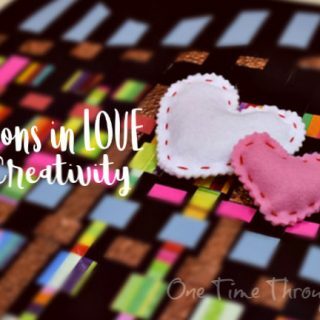 Encourage them to be creative here. 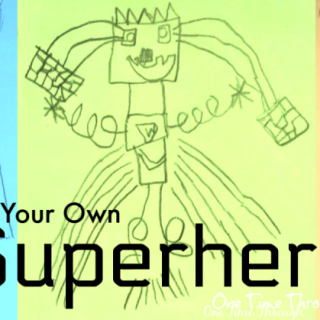 I often tell kids that there is no right or wrong way to make art. 3. 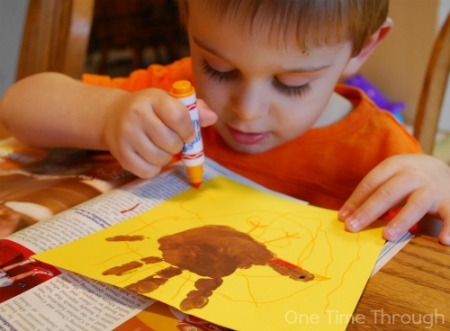 Once the handprints are dry, have your child use the markers to add legs, a beak, and eyes to make turkeys. You could use googly eyes too if you wanted to be more silly! Onetime also had fun using the markers to decorate the feathers and turkey even more! 4. Cut around the turkeys and once the canvas is dry, glue them on! 5. 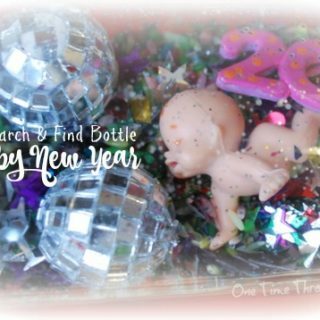 Now get out all your decorative items and the glue and let your child use their imagination to create a scene or abstract masterpiece. Onetime decided to add “corn for the turkeys to eat” all over his canvas. Onetime’s multimedia masterpiece now has a special place on our mantel for the Fall season! 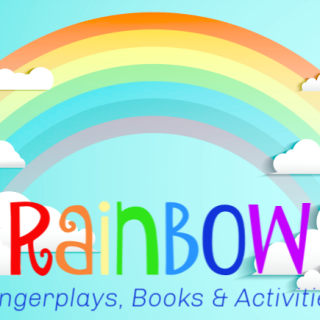 I think it’s colourful and it makes me smile every time I look at it! That’s it for our turkey handprint masterpieces. 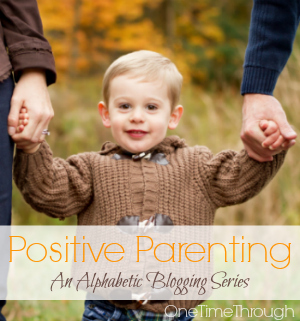 Hope you give it a try with your kids! 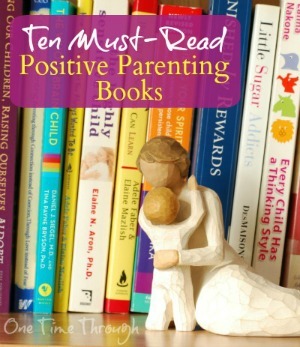 Books are a great way to stimulate a conversation about gratefulness and thankfulness at this time of year. Here are a handful of my favourites! A lovely rhyming book that will remind kids of what they can be thankful for each and every day. 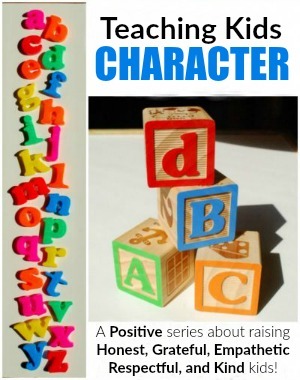 Another charming rhyming book that reminds kids to find the positive in everything they do. An adorably silly counting book, perfect for toddlers and Thanksgiving! A funny story about a turkey who will do anything to avoid becoming dinner! This bittersweet tale of a girl who gets up to mischief during Thanksgiving when she finds everyone else is too busy to pay her attention! A lovely story about a non-traditional Thanksgiving celebration. Follow One Time Through’s board Thanksgiving on Pinterest. 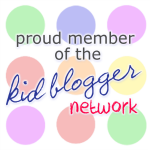 To find even more fun and educational activities as well as positive parenting tips, follow me on Facebook and Twitter. 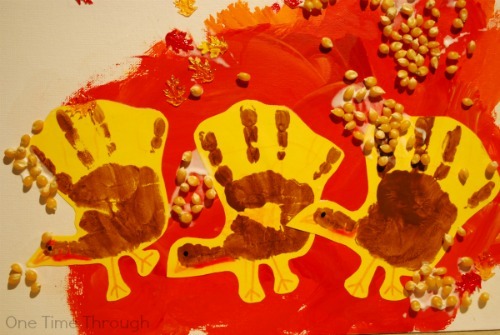 Handprint turkeys are probably the only thing I remember about preschool – and they always look cute!